3400 hours of work and three years is a long time. That's about how long it took Art Morrison Enterprises to take what was essentially a basket case 1960 Chevrolet Corvette and turn it into a machine worthy not only of Art and Craig Morrison's high standards of finish and performance, but also of the Next Edition Gran Turismo HD. With nearly a 1000 of the 3400 hours sunk into the project during the weeks preceding SEMA, the 1960 Corvette was completed just in time to take Best in Show at the 4th Annual Grand Turismo Awards ceremony at the 2006 Las Vegas show. As part of this achievement the Corvette would be forever immortalized in digital form in the upcoming Next Edition Gran Turismo, also known as GTHD. Witnessing the first stages of this process occur at their shop was a source of wonder for father Art and son Craig of the Art Morrison Enterprises operation. Art Morrison Enterprises got going in 1971 as a full service, turn-key drag race chassis manufacturer. Over its 36-year history, AME has focused on high performance, innovative chassis designs. As quarter mile mayhem started working its way back off the track with the Pro Street movement so did Morrison chassis. With the end of the eighties, custom racecar fabrication was won over by more hot rod and road going custom car pursuits. Today Art Morrison Enterprises chassis can be found under everything from 55-57 Chevys that turn .94G on the skid pad to V-8 powered Citroen street rods. The Corvette itself moves well beyond 1960 Chevrolet technology, yet visually holds onto its original looks. At the heart of the Corvette is a Bill Mitchell 427 cubic inch mill that belts out 538 hp and 517 foot pounds of torque. A T-56 six-speed out of a Viper and modified by Rockland Standard Gear handles putting the power down. Modifications are subtle enough to maintain original Corvette styling but innovative enough to push the car into modernity. The seats were reskinned to look like the originals yet rebuilt to sit lower and further back in the car for more room in the cockpit. The original gauge cluster was split down the middle and skinned with carbon fiber. The headlamps are actually a Bavarian projector beam units off a 5-Series BMW. 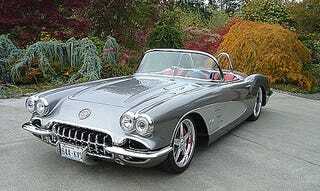 It is the unseen that sets the Vette far apart from the antiquated performance of the original 1960 version. Under the worked over exterior and interior is a top of the line Morrison chassis riding on some meaty R-compound Michelin Pilot Sport Cups. A 265 series handles the front of the car while a 295 keeps the rear in line. With Art Morrison himself in the driver's seat the Vette scales in at 3080 pounds with a 49% front to 51% rear weight ratio. Corner weights are all within 40 lbs of each other. Even with a heap of the 3400 hours of work hidden under the reworked skin, the crew that came to scan the car for Gran Turismo would miss no detail. The key to the binary reproduction of the Corvette came in a box with a crew of two. In a darkened room a thin red beam of light shot from the box across the up on the rack Corvette, and relayed data through a three-quarter inch data cable snaking from the back of the black box on a tripod. Art and son Craig Morrison were both amazed. "The first scan they did was the underside of the car. They did a pan of the chassis. As they were scanning it, in real time, there was a 3-D wireframe model being built of the car on the screen. You could actually see the relationship between the body mounts and the floor. You could see the exhaust and the clearance that the exhaust had. You could see the tread pattern on the tires, the horns, and all the fasteners holding those in place, the whole chassis, the headers, the oil pan - everything", said Craig. After the bottom half of the car was scanned in the rack was dropped and the interior transferred into binary for a complete 3-D model. "It was bizzare. A red line swept across the interior. It was sort of a spacey type of a deal. The room was somewhat dimly lit, and you would see this red line sweep across - bzzzzzzzzt. As soon as it finished it was producing a 3d wireframe model to scale on the screen", said Art. When the scan was complete a full 3d model of the car was soon rotating around on the computer screen. With a click or two of the mouse the entire car began unfolding in three dimensions on a screen in front of Art and Craig's eyes. To fill in the wireframe back at GTHD central a four-person crew took video and still imagery of the car. "They took video of me going through the gears, and the starting sequence of the car. Turning the wheel. Setting the e-brake. Pulling the hood release. Hi-beam Lo-beam. Everything." said Craig. While the binary crew is likely to come along for some more work when the Vette goes out for track testing in April of 2007, the method in which actual car handling translates into accurate gameplay remains mysterious. Art Morrison asked the digital crew a question from an analog chassis builder perspective. "Obviously an F1 car handles better than a Toyota Corolla, but how do you make it handle better on the screen"? The answer will remain a secret, but as the Gran Tursimo faithful know the cars on the screen really do handle like their genuine counterparts. To insure the car handles as it should the Project Manager on hand promised an advance digital copy of the Corvette to Art and Craig for an in-game handling test. Astounding is that it will likely take more hours to reproduce the digital version of the Corvette for Gran Turismo than did building the analog nuts and bolts version. "They have a crew of 40 people that are going to spend the next six months building our car for the game. That's the amount of detail", said Craig. The Art Morrison Enterprises Corvette will be available to everyone else as part of the "Next Edition" of the Grand Turismo franchise. We suspect that you'll have to earn it by winning a few races. When this right will be available is anyone's guess. Art and Craig are excited to be involved in the production of Gran Turismo, even though the exact release date remains a source of great mystery and speculation. The fact that the car will be immortalized in binary form is a source of pride for the father and son team. Gran Turismo 5 to be 100 Times Better?